4 09 Apr 2019 Attn. 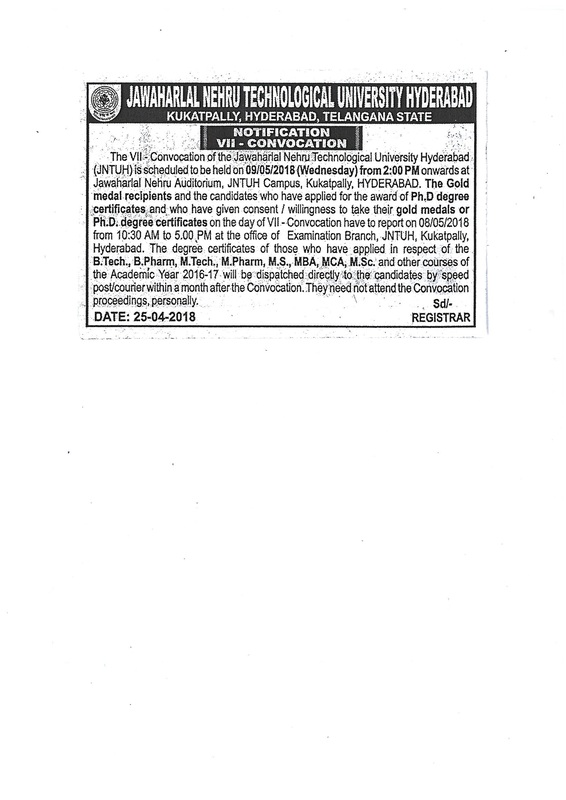 Principals of Affiliated Colleges of JNTUH - Schedule for the transfer of students for the A.Y. 2019-20. 16 16 Feb 2019 Substitute Subjects for AY 2018-19 B.Tech. and B.Pharm, II-II and III-II Sem. 28 22 Jan 2019 GIAN MHRD Course on "Crop Water Use Estimation in 21st Century with Advances in Geospatial Technologies"
37 28 Dec 2018 Attn: Principals & Faculty Members of JNTUH Constituent & Affiliated Colleges – A one day workshop on “Realizing Objectives with Project Management Skills “ on 05.01.2019 at UGC-HRDC Auditorium, JNTUH Campus, Hyderabad. 39 20 Dec 2018 Substitute subjects circular for 2018-19 II Sems. of I, II, III & IV yrs. 43 11 Dec 2018 Attn: Principals & Students of JNTUH Constituent & Affiliated Colleges – Register for IBM off Campus recruitment drive for 2017 and 2018 passed out Engineering Graduates of JNTUH. 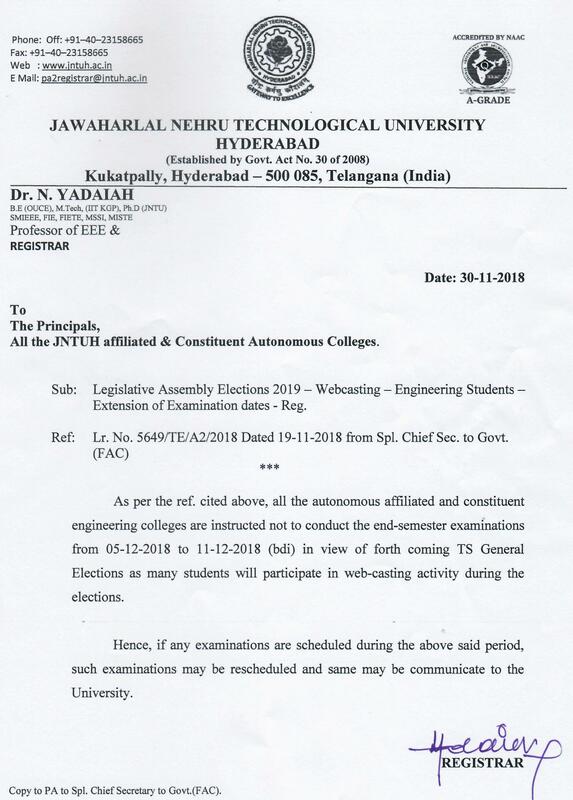 44 30 Nov 2018 Letter from the Registrar related to cancellation of exams during 05/12/2018 to 11/12/2018. 49 06 Oct 2018 " Part Time Ph.D.-2017-18 Admissions:: Instructions to the candidates and issue of admission letter"
51 18 Sep 2018 Attn: Principals & Students of JNTUH Constituent & Affiliated Colleges – A Seminar on “Career opportunities in Core Engineering Sector “ 29.09.2018 at JN Auditorium, JNTUH Campus, Hyderabad. 52 11 Sep 2018 GIAN brochure on "Urban Disaster Risk Reduction using Geospatial Technologies"
56 30 Aug 2018 Ph.D. (Part Time) -2017-18 program : List of provisionally selected candidates. 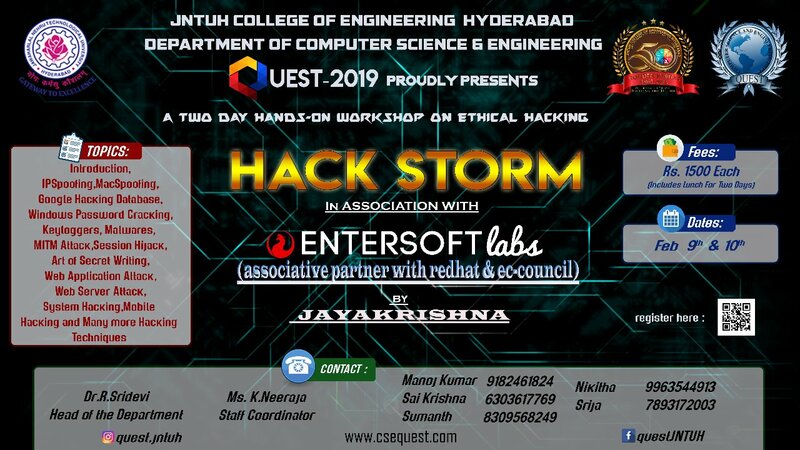 58 21 Aug 2018 Attn: Principals & Faculty Members of JNTUH Constituent & Affiliated Colleges - A Workshop on Connect Engineers to MEP Industry on 15.09.2018 at JNTUH Campus, Hyderabad. 60 18 Aug 2018 Substitute Subjects for AY 2018-19 B.Tech. and B.Pharm, II-I, III-I and VI-I Sem. 75 11 Jul 2018 BTH,Sweden-JNTUH - IDDMP - 2018 Revised Counselling Schedule on 14.07.2018 at 1.00 P.M.
77 10 Jul 2018 JNTUH DRD Ph.d Research Scholar enrolment in 2015-16(Part time & Fulltime).2016-17(Full time) and 2017-18(Foreign Students Full time) . 78 03 Jul 2018 Attn: Principals & Students: Mega Job Mela on 7th & 8th July, 2018 at JNTUH Campus. 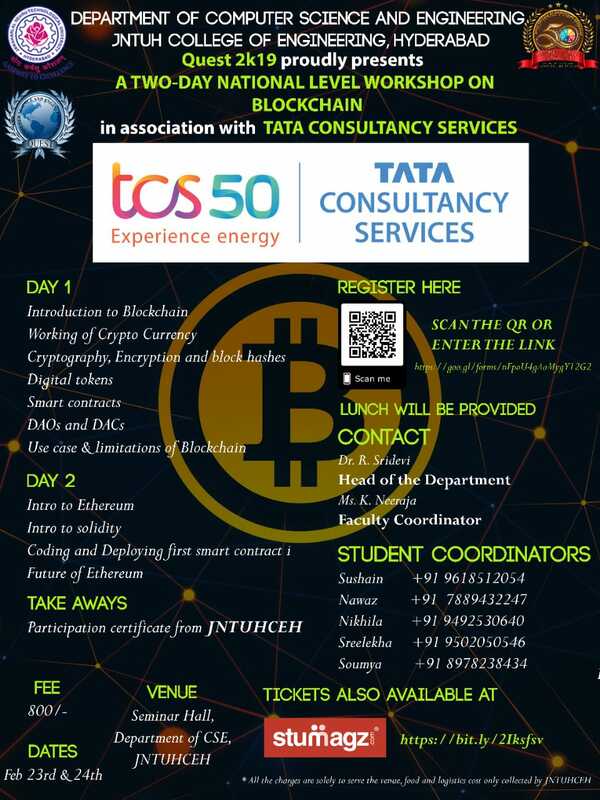 83 15 Jun 2018 One Day National Workshop on Blockchain Technologies on 22nd June 2018. 89 10 Apr 2018 Transfer of students from one college to another college for A.Y 2018-19. 95 29 Jan 2018 Substitute subjects circular for 2017-18 II Sems. of II, III & IV yrs. 97 25 Jan 2018 Upload of DCF-II data and TIF on online in AISHE site (www.aishe.gov.in) to avail scholarship and fee reimbursement from the Government.